The C140 14" Pool Lounge Chair is on sale now during our Commercial Pool Furniture Sale! 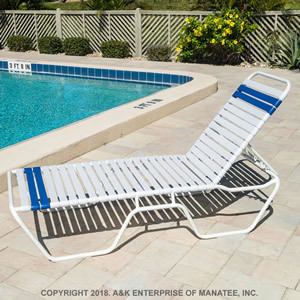 The C140 Strap Pool Lounge Chair has a powder-coated aluminum frame, support bracing, stacking design, and double-wrapped 2 inch vinyl straps featuring mold, mildew, and UV inhibitors. Customize the C140 Pool Lounge Chair with dozens of frame and strap colors. Perfect for commercial or residential use.